Honeywell Total Connect 2.0 has released their new mobile app update which will be version 3.7. To update this application go to your Apple app store or the Honeywell Total Connect website to download the Latest update. Version 3.7 will speed up the user login experience, replace the remember me feature with "keep me logged in", general improvements on the overall platform such as stability and defect fixes. GEOARM Security encourages you to update to the newest version because it will improve your overall interactive experience. We will keep you informed on all of the future Honeywell Total Connect 2.0 app upgrades stay tuned! Honeywell Total Connect 2.0 is interactive software that integrates with most of your modern Honeywell wireless, wired and hybrid security systems. 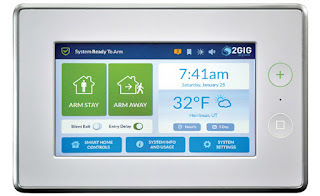 Honeywell Total Connect 2.0 software allows you to arm/disarm, receive system push notifications/email notifications, manipulate user profiles, home automation remote control and the ability to view cameras from your smart devices from anywhere in the world. The new Nortek 2GIG GC3 or GO Control 3 wireless security and home automation system. 2GIG has upgraded every facet of their self-contained alarm panel, including a redesign of the platform, user interface and menu structure made to make navigation an easy and user friendly experience. The new Go Control 3 system offers a 7 inch touch screen display with an 800 * 480 pixel resolution. A new easy to read graphical user interface which they say will reduce installation times by 30% that's huge! The GC3 panel will flaunt the ability to use 100 wireless security zones, 2 hard wired zones, 2 open collector outputs and up to 100 unique user codes making this perfect for any DIY home or business installation. The menus are designed to produce the least amount of steps to perform each function. The easy to read time, date and weather information with 5 day weather forecast allow you to see exactly what kind of week you can expect. With an easy to see countdown timer eliminates any guesswork on how much time until the panel is armed limiting false alarms. Home automation has been a focal point of 2GIG since their beginning. The new GC3 panel makes working with your home automation devices easier than ever. There are clear step by step menus to give you simple control of the home automation devices such as thermostats, lights, door locks and much more. The system can be controlled from the panel or from anywhere in the world with your smart devices. The Go Control 3 wireless system allows you to make scenes that can automatically control multiple devices at the touch of a button. For example if you create a good night scene upon activation of that scene it can simultaneously turn off the lights, lock the door and set the thermostat to the temperature of your choice. The rooms feature is a first which will allow you to group together smart home devices and scenes into a room where you can view all of the settings for that room. You can book mark a screen which allows the user to set as the home screen if they tend to use that more than any other screens. If you are looking for DIY or professional interactive alarm monitoring contact GEOARM Security 1-877-443-6276.